Are you looking for a stylish and practical flooring option to use throughout the high-traffic areas of your home? Drop by our expansive showroom today to view our collection of ceramic tile flooring. A new ceramic tile floor is perfect for the busiest areas of your home because of its unmatched durability and strength. Whether you want something bold and colorful or elegant and subdued, we have an assortment of options that can transform your home décor. Get in touch with us today to discuss your new ceramic tile flooring installation options. There are many immediate benefits to adding a new ceramic floor to your home. First, ceramic tile is extremely durable. It is renowned for its toughness and long-lasting appearance. If properly installed and cared for, your new ceramic floors will last you for many years to come. Typically, ceramic floors should be cleaned with non-acidic and non-abrasive products, in order to prevent unnecessary wear and tear. 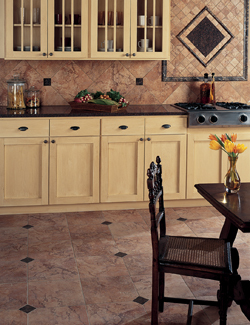 The durability and strength offered by ceramic tile represents an excellent value for any homeowner. Secondly, ceramic tile comes in a wide range of styles and colors. Because your floors are such a prominent part of your home, it’s important to find a flooring style that matches your design vision. A new ceramic floor can complement your existing décor and furniture, or tie a plain room together, creating a stylish new look. When it comes to ceramic tile options, our flooring showroom is packed with possibilities. Express your sense of style with the selection of a stunning new ceramic floor. Our design specialists will guide you through our massive selection of flooring types and styles, ensuring that your new floor is eye-catching and tailored to your stylistic desires. Finally, ceramic tile is very easy to maintain. This flooring type is resistant to spills, stains, and pet accidents, so you don’t have to worry about your floors. Keeping dust and dirt off your ceramic floors is as easy as using a dust mop or broom to sweep the surface clean. In the event that you do have to do a bit more cleaning, simply wash them with soap and water. For homeowners with busy schedules, this simplicity is a welcome benefit. You’ll enjoy continually attractive, brilliant ceramic floors with minimal effort. If you’re interested in purchasing a new ceramic floor, get in touch with us today to learn more or stop by our showroom. Our flooring specialists will show you a wide range of ceramic tile options so you can find the perfect one for your home. Don’t wait any longer to upgrade your home’s flooring; now is the perfect time to purchase a beautiful ceramic floor. Contact us when you need a new ceramic tile floor. We serve our customers in Springdale, Fayetteville, Lowell, Cave Spring, and Siloam Springs, Arkansas.